This is a sponsored post by Mediacorp. In December 2015 Mediacorp unveiled a new logo, coinciding with the official opening of its new office in one-north. The rich colour and texture, a significant departure from the previous monochromatic precedent, represent the diverse talent, culture and experience of the media company. Moving forward, the new logo also signifies Mediacorp as a window to the world and a reflection of life. While 2015 was a momentous year for Mediacorp as it celebrated SG50 and more, 2016 is the year when Mediacorp has continued its reinvention to deliver value for its clients and partners. By living up to its mission to “engage, entertain and enrich audiences”, Mediacorp has embarked on a slew of initiatives to appeal to their choice for entertainment and lifestyle. Toggle, Mediacorp’s over-the-top service has gone full steam ahead to produce their digital-only productions. Called Toggle Originals, they aim to deliver a variety of entertainment options, providing a one-stop destination for all original local productions. In addition, Toggle inked a two-year partnership with Eleven Sports Network to offer international sports content and the highly-popular English Premier League for local sports fans under the newly created Toggle Sports umbrella. With renewed emphasis on original quality content and easy accessibility, Toggle’s average monthly traffic has jumped six-fold while its video viewers have grown eight-fold since 2014. In May this year, Toggle launched Toggle Red Button service, offering live broadcast TV and Toggle’s video-on-demand services into a single seamless environment. Based on a technology known as Hybrid Broadcast Broadband TV (HbbTV), Toggle is the first in Asia to launch this technology, riding on Mediacorp’s Digital TV (DVB-T2) network. This year also marks a major milestone in Singapore’s TV history as Mediacorp completes its roll-out of Digital TV across all housing estates island-wide on its DVB-T2 network using indoor reception. Currently, six out of its seven free-to-air channels are broadcast in High-Definition. Viewers can enjoy Mediacorp’s original programmes such as Tanglin in High-Definition. The English long-form drama, shown on Channel 5, is now in its second season with over 200 episodes on the lives of multiracial, multigenerational families living and working in the Tanglin area. As the official broadcaster for the Rio 2016 Olympic Games and Paralympic Games, Mediacorp broadcast the games live on okto, its channel for sports, and for viewers-on-the-go, Toggle. More than 2.75 million viewers tuned in to the broadcast on okto and almost 11 million video views were recorded on Toggle for live and catch-up viewing. Channel News Asia posted 115 videos on its Facebook page that registered 18 million views. In today’s world of abundant content and highly limited attention, Mediacorp is taking great strides to ensure that audiences seek out its content by delivering them over multiple platforms – whether it’s on free-to-air TV, radio broadcast, digital, print and on-ground events. As Southeast Asia’s largest producer of English and Mandarin content, Mediacorp still has ambitions to be bigger and better and is actively seeking collaborations and investments in co-productions with partners to explore new business models. With its rich catalogue of original titles and the growth of over-the-top players in the region, Mediacorp is also looking at ways to fully exploit the potential of IPs through licensing, format sales and co-production from its rich library of original content and formats. Understanding audience and their needs are vital ingredients to creating good local content that resonates with our audiences. Mediacorp has been investing in consumer insights and analytics to aid its efforts to take its entertainment content to the next level. Besides the usual viewership data and feedback from digital media, creative concepts and pilots are systematically tested with audience panels for useful insights that are used to fine tune the concepts/pilots before they are green lit and produced for both TV and digital audiences. Mediacorp is also reinventing the way it sells. With increasing media fragmentation, it is more critical than ever for advertisers to have the total audience view for them to understand how to reach the right audiences with the right messages via the right touchpoints. Earlier this year Mediacorp launched Customer 360, a proprietary planning system that unifies five media currencies – TV, print, radio, out-of-home and digital – on a single platform to enable total audience planning. The company has also re-organised itself according to customer segments, so that it can focus on the target audience and provide them with relevant content, regardless of media platform. Mediacorp has started its migration from its iconic Caldecott Broadcast Centre in Andrew Road, its home for the past 60 years, to its new home in one-north. A digital-first integrated newsroom staffed by some 700 journalists producing for digital, television, radio and print. Three TV news studios will beam news in four languages terrestrially, as well as Asia-wide. Four entertainment studios which are seamlessly integrated with back of house operations to facilitate the movement of large props and the quick turnaround of sets. One of these will be able to host live audiences of up to 500 people. The MES Theatre at Mediacorp, a 1,500-seat performing arts venue, the only one in the region of this scale that is broadcast-ready. It will welcome audiences to musicals and concerts presented by the company’s live entertainment arm, VizPro International, as well as external players. Two restaurants and one cafe will offer pre-show dining options. The building’s interior is designed around an open plan office concept which provides for the best use of space and unprecedented opportunities to drive collaboration, knowledge sharing and creativity among staff. For its sustainability features, the building has been awarded Building & Construction Authority’s Green Mark Platinum rating. 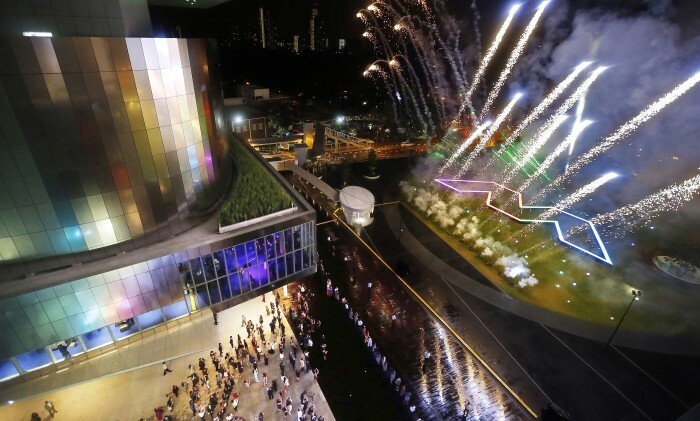 A boost to Mediacorp’s transformation, its new home supports an invigorating, innovative culture enabling the company to strive for and better serve its audiences.